Figure 1. Linear presentation of a circular panorama (old panoramic photographs on paper or a large canvas, rectangular images on a computer screen). Figure 2. The principle of an infinite rotation presentation of a circular panorama (circular room or a computer screen and panorama viewer). Figure 3. Warsaw 1873 circular panorama in Flash 6. The tradition of taking a circular series of photos from a single focal point, in order to show broad views, originated in the mid-19th Century. These sets of photographs were often joined together into a single panoramic image. Although they precisely document the surrounding view, spatial understanding of the landscape, angular locations of objects in the field of view, and mutual distances between these objects, are difficult to perceive and compare. This is obvious, if we recall the fact, that our immediate visual recognition of surrounding space is determined by an ocular, sequential scan (by turnig our head around), with an active field of view limited to approx. 70 degrees. Therefore, it is much easier to acquire spatial information when playing a forward-backward a video clip, recorded moving camera around a vertical axis on a tripod, or when scanning the panorama leftward-rightward through an observation window (see Figure 1), than to acquire spatial information encompassed by a very broad panorama pieced together from a series of photos and printed on paper, or by a very broad, panoramic painting on a large canvas. For such panoramas it became natural to present them on surfaces surrounding the visitors. 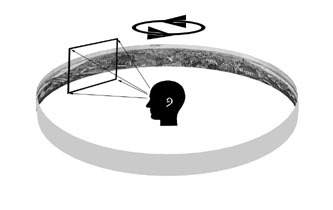 The next step toward facilitation of perception is displaying the panorama interactively on a computer screen (see Figure 2), with the help of suitable viewer-software, such as a Java applet for low resolution panoramas, or Shockwave or Quick Time application for high resolution panoramas. These viewers allow infinite rotation in both horizontal directions, zooming in, and upward and downward tilting in the vertical boundaries of the panorma. Such a tool makes the whole perception process more intuitive and efficient, especially in the case of very wide, or circular (360 degree), panoramic photographs. The mapping process in our mind here is quite similar to what we use in the real environment. In this way we can learn more from old panoramas than our predecessors, who had to take in entire panoramas at a single glance. The old panoramas, in their classic form, are present on the Internet. In our pilot project 2001, we converted and displayed in this way 7 panoramas, among them, 2 all-around panoramas from Internet directory of old panoramic photographies of Library of Congress. They have undergone basic retouching in order to reduce optical noise. Due to the low resolution, a Java viewer was chosen. In similar way, a circular panorama of Warsaw, dated from 1873 and archived at the National Museum in Warsaw, was first displayed with this technique in August 2002, using both PTviewer and Quick Time plugin. Web resolutions examples are available at the url: www.eurofresh.se/history/ and on CD.